The solemnity of the 100th commemoration of the Anzac victory of courage and dash in the 1917 Battle of Beersheba was desecrated by the opportunistic propaganda of PM Netanyahu, by the Australian PM Turnbull’s grovelling echo of Israel’s outrageous lies and by the business pragmatism of Israeli patsy, the Aotearoa/New Zealand, Governor-General Reddy. For months, while Australian and New Zealand descendants of the Anzac soldiers emotionally prepared for the reenactment of the Light Horse Brigade charge, the commemoration was being not so subtly defiled by the Israeli propaganda that conflated the Beersheba victory with a ‘paving the way’ for the modern state of Israel which was dutifully regurgitated by Australian media. Connecting the courage and the sacrifice of our Anzac soldiers with the Nakba – Israel’s terrorism and ethnic cleansing of indigenous Palestinians which is the real foundation of and paving for the unilateral establishment of the state of Israel – is beyond the moral pale. During the Nakba, the vicious Jewish militias systematically expelled 750,000 innocent Palestinians from 670 villages and towns. The trauma of the Nakba persists today as 7 million Palestinians are denied by Israel, their legal right of return and Israel’s perpetration of daily crimes against humanity and war crimes against the remaining indigenous Palestinians. The ‘below the ground’ was a reference to the previous day’s preemptive Israeli military strike on a Gaza tunnel killing 8 freedom fighters. Until now, comparisons between Israel and the Nazi regime have been repudiated on the grounds that Israel had not gassed Palestinians, however this attack was an experimental test of a new weapon using poisonous gas – a Nazi tactic. The 8 Palestinian martyrs never stood a chance. This demonstrates the cowardly disproportionate use of Israeli military where no Palestinian ever stands a chance. For all that, sumoud – Palestinian resilience lives! Ever on the look out for a business opportunity, unbelievably, mid-speech, Netanyahu spruiked to New Zealand a water deal that Australia and Israel had just made. Netanyahu had opened his speech with the allusion to the hackneyed lie that Israel made the desert bloom. When welcoming guests he stated Beersheba was in 1917, ‘a village of a few huts’ when in fact, Bir as Saba, had been a thriving Bedouin trade centre located on a vast open plain surrounded by rocky hills and outcrops through which, in Ottoman times, the railway ran from Istanbul to Eastern Sinai. WWI had a devastating impact on indigenous Palestinian villagers struggling to survive the dire economic impact on their land and livelihoods by the mounted armies of the Imperial and Ottoman forces. The Turks had demolished orchards and all the cavalries ‘drank out wells and grazed their horses on standing crops’. Palestinian foodstuffs and livestock were requisitioned by the British military and consequently there was a shortage of basic food and commodities with awful disruptions to daily life. Netanyahu, blithely overlooking the fact that Bir as Saba had Caananite origins, referred to it as ‘the city of Abraham’ thereby coveting slyly the land as solely Israeli when notwithstanding, according to myth, Abraham was the father of both Arabs and Jews. But neither Netanyahu, nor Turnbull nor Reddy acknowledged the people of Palestine. A Turkish representative was invited but Palestinian leaders were cynically sidelined. Netanyahu boosted the fantasy that, “Four thousand years ago, our forefathers came here” when the majority of Israeli Jews came from Europe, specifically, according to Jewish intellectual and author, Arthur Koestler, from Khazar, a Turko-Baltic area. “Beersheba resident Hedva Chadad had not heard of the historic battle, but knew her two grandchildren would enjoy seeing the 100-horse march down Beersheba’s main Ha’atzma’ut Street by volunteer Australian riders in period uniform.” And elsewhere it was reported that there were more foreign visitors than Israelis attending the historic ceremony. Netanyahu could have used his God-given talent [oration] to pursue peace with Palestinians. He could have persuaded Israelis that reconciliation is vital to their future. He might have raised hopes rather than sow despair, could have pushed forward instead of digging in, might have worked to resolve differences rather than turning them into insurmountable obstacles. But then, of course, he wouldn’t be Netanyahu. Firstly, the Anzacs didn’t singly overthrow the Ottoman Empire. The Battle of Beersheba was fought under the Egyptian Expeditionary Force commanded by General Allenby made up by a number of English, Welsh, Irish, New Zealand regiments as well as the the Australian 4th and 12th Light Horse Brigades. Turnbull expelled the Brits from history along with the Palestinians. And legally, the Balfour Declaration, was replete with empty words – it was a virtual promissory note for a Jewish homeland in Palestine given to the Zionists a year before the Ottoman Empire fell when the British had no sovereignty over Palestine. 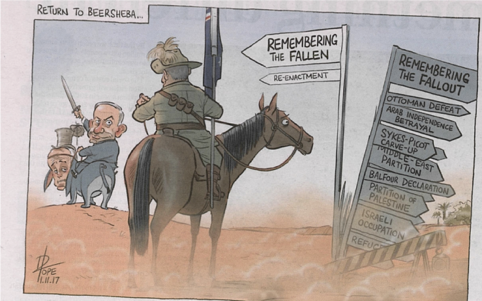 The impact of WWI was its expose of the butchering, bungling and futility of war, but Turnbull brushed that aside by sealing a defense industry memorandum with Israel on the day before the Beersheba celebration. It is true that they ‘have shared values’ – of colonial supremacy and racism- see Turnbull governments’s recent refusal of a referendum to give Australia’s First Peoples a voice to parliament and the cruel offshore incarceration of legitimate asylum seekers, all of whom are non-caucasian. The agreement was endorsed by NZ Vector Ltd’s $10 million investment in mPrest -the software developer of the Iron Dome missile defense system which was tested on the innocent men, women , children, infants and elderly of Gaza since 2011. mPrest is half owned by the Israeli government’s armament manufacturer, Rafael Advanced Systems. Reddy also docilely accepted President Rivlin’s exploitative spin, “ One hundred years ago, New Zealand’s soldiers helped free the Land of Israel from the Ottoman Empire in the First World War.” (There was no Land of Israel in 1917). Feeling right at home in the rogue state of Israel, Reddy even had time in her busy Beersheba schedule to do some gardening, planting a tree for for the Jewish National Fund (JNF) in the Grove of Nations in Al Quds. Was it her NZ colonial mindset that tactfully overlooked JNF raising of billions of dollars since 1901 to dispossess indigenous Palestinians from their land by funding settlements and judaising the Negev where the Battle of Beersheba took place. Only a week before, Israeli authorities demolished for the 120th time the Bedouin village of al-Araqib located on centuries-old traditional lands a few kilometres from Bir as Saba. Under NZ’s ongoing colonial control, Maoris, like the Bedouin, are reasserting their identity and rights. KKL-JNF Chief of Protocol Andy Michelson (with tongue in cheek?) told Reddy JNF “has become an expert in afforestation.” Yes, it has been planting forests over Nakba destroyed Palestinian villages and dedicating forests to foreign leaders complicit in Israel’s oppression of Palestine. Turnbull would be over the moon to add a Malcolm Turnbull Forest to the list: the Jeff Kennett Forest, Bob Carr Forest, Arthur Calwell Forest, Australia-Israel Friendship Forest, Sir Zelman and Lady Cowen Forest, Bob Hawke Forest, Sir Harold Holt Memorial Grove, Sir Robert and Dame Pattie Menzies Forest, Dr HV Evatt Forest, Sir Thomas Blamey Forest, Sir John Monash, John Howard Forest, South Australia-Israel Twin Friendship Forests. Netanyahu, Turnbull and Reddy were not bestowing honour on young men who served their nations. No, they were eager participants in the Israeli occupation of ANZAC history and the dispossession of truth.